Gorgie Workshops is the oldest of our four day service buildings. Set over two floors it houses a range of workshops offering creative and productive opportunities. These include an organic Bakery and Confectionery supplying 18 local shops and a Tools refurbishment workshop that works in partnership with other organisations refurbishing tools and hand operated sewing machines that are shipped to projects in developing countries. The building also supports two working joineries and a canteen staffed by Members making up to 60 vegetarian lunches each day. 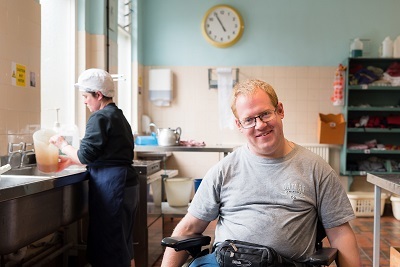 Given that our Members can have physical as well as learning disabilities it is important that our day service buildings are all accessible, particularly as demand for our services continues to grow. The top floor which houses the canteen and meeting rooms is currently accessed via a single stair or an ageing stair lift. The stair lift requires staff assistance to use which detracts from the sense of independence we support and is so valued by our Members. We are currently fundraising to allow us to improve accessibility, create a new, welcoming reception area, install a lift and new evacuation stair. The Confectionery Workshop will be able to move to a better space enabling greater wheelchair access, with new equipment and workspaces designed to meet a range of accessibility needs. Neil, pictured above, has attended Gorgie Workshops since 2007. “It has made a big difference to my life.” The planned improvements will make life easier for Neil and his sense of independence will no longer be compromised as the building will be more accessible and safer for everyone attending who has physical challenges as well as a learning disability.